Oats are naturally packed with so much nutritional goodness, which is why they make an excellent addition to any health-oriented diet. 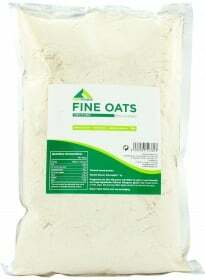 If you are looking for top quality powdered oats for your diet, Firm Foods Fine Oats is the answer! Firm Foods Fine Oats lets you enjoy pure and fine powdered oats that you can add onto your favorite smoothies, protein shakes, and baked goods. Oats are loaded with so much health-boosting nutrients, such as vitamins, minerals, protein, dietary fiber, and carbohydrates – making it an excellent source of nutrition for active people like you! If you are trying to bulk up and build lean muscle, oats can help you achieve your goal by providing you with much-needed protein and carbs. If your goal is to lose weight, oats can still help because it can keep you feeling full for long periods of time and minimize your caloric intake at the same time. What the possible benefits of consuming oats? Supports lean muscle growth, repair, and maintenance! Promotes the regular elimination of body waste! Keeps you feeling full for longer! Besides adding this product to your shakes, you can also use it as a substitute for plain flour. Enjoy premium quality oat powder that will support your active lifestyle... try Firm Foods Fine Oats today! Have a question about Fine Oats? What is it, what does it do, how and when to use or something else? Ask us. “Fine Oats 1kg” is currently out of stock. Enter your details below and we will let you know when it's back in stock. WARNINGS Fine Oats : Store tightly closed in a cool, dry place. BEST BEFORE: Please see lot number and expiration date stamped on the packaging.